Bill quickly felt boxed-in with only 19 days to visit Tunisia and struggled with planning our itinerary on the fly. Having almost 3 weeks had seemed like enough time before we arrived but of course one always learns of more possibilities once in a region. And we did spend a few more days than planned in Tunis resolving internet connection problems on the new cell phone as there was little internet available to us otherwise. An elderly woman was tucked away in this shrine's prayer rugs. As always, Bill wanted his plan to be the best possible use of our time but he had less leeway than on our more open-ended bike tours. Our ferry ticket saleswoman had been very clear that the sailing date for our return to Palermo was non-negotiable. Deciding that it wasn't going to be possible to visit all of the Roman sites in Tunisia in a way had made the planning easier and it was then that we settled on balancing our visit with other more modern elements. 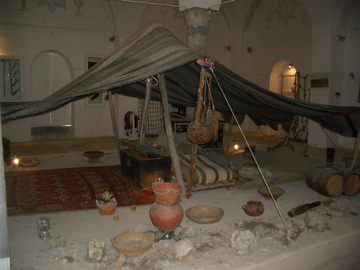 We'd go to Le Kef to see the ethnographic museum with its Berber tent. 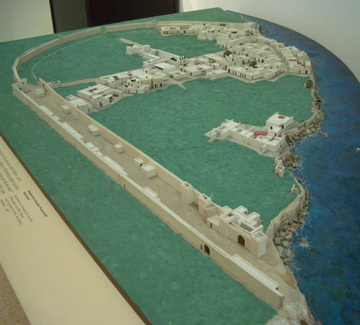 Then it would be on to Kairouan, the holiest city of Tunisia. Holy would be countered with the unholy--Hammamet, the most popular tourist resort in the country. Those slices of Tunisia would complete our first taste of Tunisia except for a final archeological site on the way into Tunis. A camel coat for the cold. Our visit to inland Le Kef didn't get off to an auspicious start. We survived the windy road in the little 'louage' bus better than most--our lunch was still in our stomachs--it was someone else's vomit lightly misting the back of my pant legs and suitcase top. But darn it anyway, it snowed that afternoon. While totally unexpected, the chill in the air when we arrived at this 2600' village made it plausible. We were thrilled to discover that a trickle of heat was already warming our room in the mid-afternoon but that trickle was insufficient to make us comfortable as the temperatures began to drop that evening. As we explored the few medina streets in Le Kef, it became clear why they miss out on much of the press of tourism: it is colder than other areas in the winter and sizzling hot in the summer. Most of the tourists come to Tunisia in the middle of the summer heat but hang close to the cooling beaches. Spring and fall are when those who usually venture to Le Kef arrive and it was indisputably too early for the crowds. 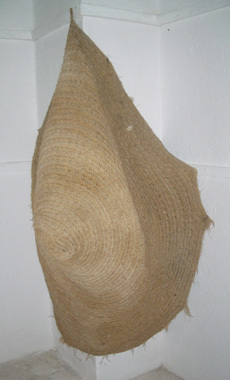 We came to Le Kef for 1 reason, which was to visit their museum with a Berber tent display. Well, actually we came for 2 reasons as our guide book said that the medina was worth a look, but we quickly settled on being there for just 1 reason. It was a long trip for a single activity, but like going to the considerable trouble to visit the camel market outside of Cairo, where else were we going to see a Berber tent? A Berber summer tent--women on the left, men on the right. The Berber tent was very spare with the most unlikely furnishings being big wooden chests--the poor camels who carried them! Being cold myself in the unheated museum, I was quite concerned about the tent having no walls. We were experiencing wicked winds and the tent would have afforded little comfort in these conditions. The roving staff man explained that this was a summer tent and that a winter tent would have walls. "But what about the sand?" I thought, always being too practical. It seemed even a summer tent should have a barrier keeping the grit out of the gruel. But the only mention of walls for the summer tent was of the withheld fabric barrier that would have prevented straying eyes crossing from the men's side of the tent to the women's side. Hard to imagine that nomads in the desert couldn't work out their social relationships in a more congenial way. Pleased with seeing the Berber tent and learning that the few women we'd seen on the streets in Tunis with small facial tattoos were Berber women, we departed with our meager Le Kef sightseeing trophies. Continuing with our new agenda to see aspects of Tunisia besides the archeological sites, we were now in a slightly larger vehicle heading out of the mountains to Kairouan, the holiest city in Tunisia. But like Le Kef, it quickly became clear that Kairouan was short on content for us. We could not enter Kairouan's Great Mosque . 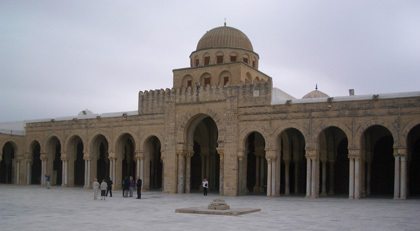 Kairouan's mosque is the 4th holiest site in the Muslim world, after Mecca, Medina, and Jerusalem. But as was true in almost all mosques in Tunisia, non-Muslims weren't allow inside. We were grateful to have wandered at will in several mosques in Turkey and to understand that there isn't all that much to see inside many of them. 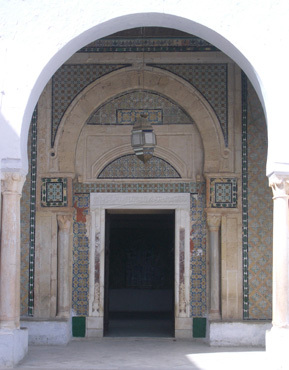 We knew from our experience in Turkey that the peek inside the door of Kairouan's mosque was telling most of the story. But still, we'd have been more satisfied with the admission price had we been able to inspect the interior more fully. The historical aspects of the mosque were like those of most European cathedrals: it had a long history but much of what remains is relatively new. But we admired the exterior Roman columns that had been hauled from the coast for the building project and fended off the touts with similar come-on's to those in Tunis. Shrine doors we could not pass through. Our multi-site Kairouan ticket gave us partial entry into several shrines but, like the mosque, we couldn't get very far past the door. It was more of a walking day with a look now and then at regional artwork rather than the grand tour of historical sites we'd expected. Sticking to the archeological sites was looking like a better strategy--but at least now we knew for sure that that was true--no niggling "Maybe we should have gone to...." remained. We'd seen 2 different sides of Tunisia and there wasn't all that much to see of either of them. We'd just arrived at the seaside tourist resort of Hammamet at the end of our second week in the country and I found myself gasping "All of the nicest things in Tunisia are donated." 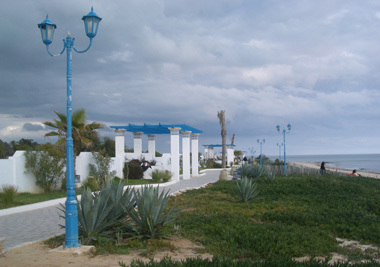 We were in the mist of a string of marginal accommodations and were finding much lauded Hammamet less than delightful. We were so glad we were paying a third of the high season rates for our only fair, 3-star room when we came upon a fine beachside promenade. At last, we'd found something lovely in Hammamet, in Tunisia. The level and even pavers allowed one to walk without carefully planning each foot step; the plantings were plump and full instead of demonstrating various stages of their death cycles; and the freshly painted wall politely separated the walk from the huge unkempt cemetery. The Prince of Monaco's gift of a lovely seaside promenade. My harsh 'donated' comment came at one end of the short promenade when we read that the Prince of Monaco had collaborated with Tunisia in creating this lovely walk in 2006. "No wonder it was so nice--it was given to them" I thought. It was just like at the archeological sites we'd seen the first week in the country in which the best exhibits were products of overseas universities or travel clubs. Surely that "nicest things were donated" was too harsh, too broad of a generalization, but it fit with our limited experience. But my follow-up comment echoed the same sentiment: "I hope the Prince established a maintenance fund for the promenade." Hammamet is home to package tourism; a destination for those spending a week or 2 relaxing on the private beach in front of their hotel. That's not our idea of a vacation but we felt like we'd have been mighty disappointed if it had been. One could probably stroll the length of the Prince of Monaco's promenade and the beach-restaurant area just beyond it in about 20 minutes; then what? Even the sunbathers longing for some R&R must want a little change in scenery after several days of dividing their time between their hotel room, the hotel's eating areas, and the very narrow hotel beach. And if they weren't staying at one of the 4 or 5 star places that were hopefully substantially finer than our 3-star abode, they'd be looking for a change of venue sooner than that, but it wouldn't be there. 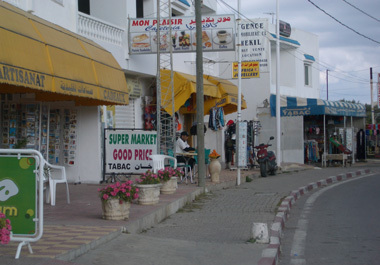 Hammamet's tourist strip looked like any other in the Med. Hammamet's medina touts were also more tiresome than most. We instantly were clobbered with their preferred line: "Don't you remember me? I am the cook at your hotel?" I laughed grandly at the first one and retorted "No you're not." A few minutes later he circled by on his bike saying "Have you heard that before? Where?" At least he was paying attention. So tedious was the repetition of the 1 favorite tout come-on in Hammamet instead of the rotating 3 lines we heard in Tunis, we brainstormed a new line for them during lunch the next day. My favorite would be a variant on "You speak English? I am learning English, can I talk with you?" That intro line followed by a very specific question on grammar or pronunciation would be disarming and get many to stop to answer the surely sincere question. But, just like resisting the temptation to correct European kid's pronunciation of English profanity, we declined to share our suggestions for new come-on lines with the medina touts. "Ah, this is my kind of tourist compound" was my visceral response when our taxi stopped at the gate to the Kerkouane archeological site 8 miles outside of our next layover town in northern Tunisia, Kelibia. I recognized the class of Tunisian archeological site instantly and we were in luck, there would be toilets. Hammamet had been nothing special for us and after a trying night in our spare Kelibia hotel room, the Punic site at Kerkouane was immediately soothing. We'd rushed to take our evening showers the night before having spotted the solar water system on the roof. There was no telling how well matched the storage tanks were to the number of bathing guests and the warmth wouldn't last long in the uninsulated tanks. We spent 2 chilly nights in a spare room in Kelibia. The shared shower and toilet facilities and lack of heating had made for a long evening in our little room in Kelibia. 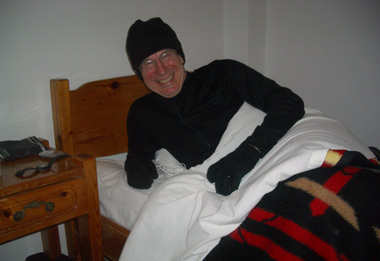 I wore my winter hat and gloves plus all of my winter clothes during the cold evening and wore most of it to bed. When I awoke at 3:30am I was finally warm enough to shed an item or 2 for more comfort. In the morning, the very slow draining sink serviced with only a cold water tap wasn't draining at all. We knew the second night in the little hotel would be just as trying, so we'd hoped for a pleasant ambiance and warmth from the sun at the Kerkouane historical site during the day. Being at the ancient Punic city in the countryside would give our nervous systems the soothing interval they longed for. The incessant noise from unmuffled motorcycles and retailers blaring screechy music through low quality speakers would be gone. Instead, the only unnatural noise would be the radio at the ticket counter which greeted us with a familiar tune from an Oregon band, Pink Martini. There would be no traffic to dodge, as there always was on the streets and sidewalks, so the surveillance settings in our minds could drop from steady "High Alert" to "Snooze". We could amble in peace and safety. At most, there would only be one hopeful guide to deflect instead of a stream of touts as in the medina's. And the extremely potent second hand cigarette smoke in Tunisia would only assault my head and lungs while in the small museum. 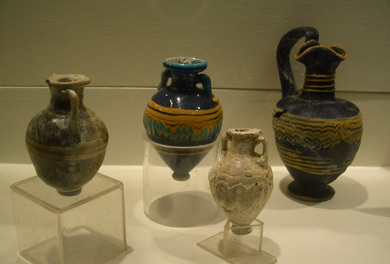 Well displayed pieces of stunning Phoenician glass. In our first minutes at the archeological site, we were dividing our attention between inspecting the ruins and selecting a wind sheltered place for our lunch. The curving, recently reinforced wall and riprap protecting the site from the sea would give us plenty of options. Our minds savored the image of sitting by the sea in the welcome isolation from the often jarring local culture. We would be sheltered from the noise of the city, from the cold in our room--we'd enjoy warmth and peacefulness. After lunch we'd pull out our books and extend the experience deep into our bones. We enjoyed the archeological site for the rare opportunity to see a fairly intact Punic city and for the unusually well displayed finds in the museum and then moved down to the sea for lunch. But darn it anyway, the showers that had been in, and then out, of the day's forecast arrived before we pulled out our final course of too-crunchy pears. We stoically sat like the nearby fisherman through the alternating sprinkles and winds, then had to run for cover from the soaking rain. The warmth that we'd hoped to store in our bodies and that might penetrate our hotel room was gone. We hung around the site for 45 more minutes hoping to retrieve the fantasy, but it wasn't to be. A model of the site's excavated areas & our rocky picnic choices. After confirming our meager transportation options for getting back to Kelibia from this remote site with the site clerk, we decided to do the unmentionable in Tunisia, we would walk. We estimated that it would take us about 2 hours which was perfect--we hadn't had a vigorous 2 hour walk since we arrived in Tunisia. Our only other substantial walk had been for an hour and half our first week in Tunisia to the suburban Bardo Museum in Tunis, though the tourist info woman told us it wasn't possible. We listen carefully when people tell us it isn't possible to get from A to B on foot or bike as we've been stymied before. We spent hours trying to leave Barcelona on bike one year and finally relented and took the metro. The web of freeways was too dense to the south and we couldn't find a way around the 'no go' zone of the port, the industrial area and the overpasses. And in Italy when leaving Livorno, near Pisa, we barely made it through the maze. We spent over an hour trying to find a chink in the armor. Finally we followed another cyclist across bits of the freeway to make our escape. So we pondered the Tunisian woman's warnings carefully when she had said it wasn't possible to walk to the museum in Tunis. Bill recalled however that the tram went all the way from downtown Tunis to the Bardo museum, so it must be possible. Lacking a map that she was supposed to be able to provide, we walked along the tram tracks to the museum. In Tunis, just like from the Punic city at Kerkouane to our hotel at Kelibia, there were no logistical problems with our long fitness walk. Sidewalks and less traffic would have made both more pleasant, but getting some concentrated exercise had its rewards. In Kelibia, the exercise was our consolation prize for the showers cheating us out of our one Tunisian opportunity to be lizards on a coastal rock reading our books. The following day we took one last intercity bus, this time back to Tunis. Our tour of northern Tunisia was about over. Just like in Egypt, our starting point hotel didn't seem all that great when we arrived in Tunis, but we could hardly wait to get back at the end of our tour. This time the return of the warm weather, plus the bathtub, plus the on-demand hot water didn't equal a relaxing soak in the tub but instead conjured images of doing laundry. After wearing my long johns 24 hours a day for the better part of a week, it was time to wash. Most of our rooms had been too cold at night to shed anything for washing beside our underwear. And had we been so bold as to give up our long johns for washing in those cold rooms, there was no way the garments have dried by morning. 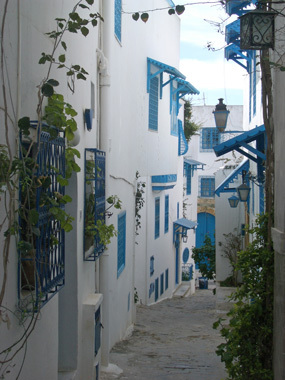 Sidi Bou Said's charming alleyways. The next morning in Tunis we packed away our freshly washed long johns that thankfully weren't needed and stashed our bags at the hotel for the day. We'd take the local train out to the popular resort area of Sidi Bou Said. It was indeed on a pretty hilltop setting but the most picturesque part of the town was the short row of souvenir shops. We'd come armed with our books and after being shooed out of entering one park by the police, we found a relatively quiet place to settle after exhausting the scant sightseeing options. We enjoyed the warm sunny day and relaxing tempo in Sidi Bou Said though wouldn't choose it for a holiday destination. Then it was back to Tunis to pick-up a box of buttery pastries for our Palermo hostess holding our suitcase and to retrieve our bags from our hotel. We also did something new this year for our food safety, which was blanching most of our produce to kill the superficial bugs washing might have missed. Cauliflower, carrots, and tomatoes all got a dunking in boiling water before eating them relatively raw. We however bypassed this precaution with our lunchtime fruit that would sit out for hours after blanching before being eaten. It was a nuisance but blanching was so reassuring that we did complete the ritual every night. The French influence was in the architecture as well as the pastries. 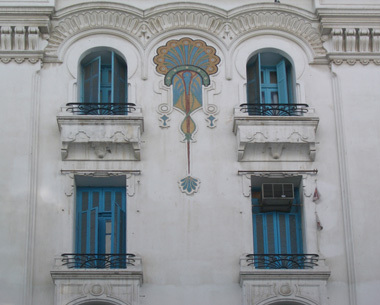 The French colonial era in Tunisia shows in the architecture, the bilingual signs, and in the pastries. My, my, but did they have stunning pastries, cakes, and cookies in the shops. Lavishly decorated and beautifully displayed whole cakes and single-serving items filled their cases. The waiters impatient for us to take a table rather than just look deterred me from taking the longed-for photo. We sampled the simpler flakey pastry items at our Tunis hotel breakfast buffet and some tiny little goodies where we bought the sampler box of pastries for our Palermo hostess. The delicate texture and buttery flavor took me back to mother's butter cookies. I was talking about the truffle-sized little pastry I bought for days afterwards as butter has been off our menu for 2 decades. The other notable breakfast item in Tunis was Chakchouk, a stewed vegetable dish. At the hotel it was made with okra and tomatoes though our store-bought jar had eggplant instead of okra in it. Both variations had a heavy dose of chili peppers. Some days my palate with a low tolerance for spicy foods was overwhelmed with the hotel's varying preparation of the dish. And I was reduced to diluting the half teaspoon I could tolerate of the grocery store variety with chopped fresh tomatoes for my dinner sauce as it had too much sizzle for me. Chili peppers were abundant in the grocery store and I noticed one of our guide book phrases in the food section was "Not too hot, please." We were delighted to find a western-styled grocery store, a Monoprix from France, in Tunis. The street markets were fun but a trying way for us to shop. It's always a relief for me to pick out my own produce rather than throwing out 20% of what was selected for me, though the cauliflowers and tomatoes were in better shape on the street than in the store. Being able to price shop and read labels at our leisure was another joy of western markets instead of pointing at items stored behind the counter and hoping it was the best choice available. And having everything in one market instead of standing at line for our turn at with string of vendors was also a calmer way to shop. The downside of the Monoprix was that the aisles were just as packed as in the Medina, making it almost impossible to navigate with even a hand basket. The prices for food in the markets in Tunisia were similar to Italy and much of Europe. The price of bread, as in some other countries, is fixed by the government. Bottled water was a little cheaper than Italy but much of the produce was similarly priced or higher and the quality was substantially lower, except on the greens. Their array of leafy green things went beyond my vocabulary and the vendors kept them moist and succulent by splashing water on them. I suspect the fennel was a good value as we'd see tiny trucks loaded down with both fennel and oranges. Would our bikes be welcomed at the shrines? Once back at the starting point of our Tunisian adventure in Tunis and while wandering around nearby Sidi Bou Said, it was compelling to review what we'd seen and experienced over the last 19 days. The main archeological sites at Carthage and Dougga had been rewarding and deepened our sense of Phoenician and Roman history. And though we hadn't seen them all, we were convinced we'd seen the best of the ancient sites that Tunisia had to offer. Knowing what we know now about Tunisia, we'd probably rent a car for part of the trip so as to more readily travel farther south into the country and to the more obscure historical sites. With the efficiency of a car, we could see all that we cared to see in the entire country in 3 to 4 weeks. 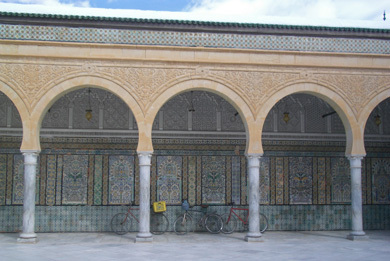 We'd also consider Tunisia as a cycling venue, with more about that in "Country Details" if you are interested. And like Iceland, Tunisia is probably one of the better places to visit with a group tour. The list of places to visit in Tunisia is on the short side and the time required to thoroughly see most sites isn't great, so the risk of being short-changed by being with a group is reduced. Being in a group would be a good alternative to renting a car for having your own wheels in Tunisia. The goats roamed with us at Bulla Regia. The historical sites had exercised our brains and the occasional animal life had us pondering simpler matters. We'd spotted a few delicate, snowy white egrets in the fields, which are always fun to see. 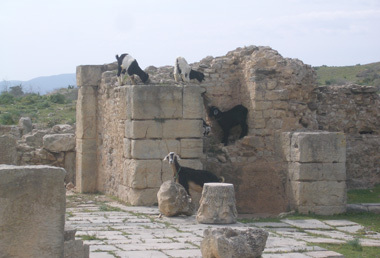 We'd watched a dozen scruffy looking storks fighting over nests in the little park in front of Jenbouba's train station and been amused by goats irreverently roaming the archeological site at Bulla Regia. We'd been amazed to see a another roadside goat resting a hoof on cactus spines while munching on a seemingly indigestible tree. And we repeatedly did a double-take when seeing the considerable use of donkey carts for pulling heavy loads of building blocks. I'll remember Tunisia for fennel and oranges, as they were cheap and plentiful. Hand carts and little trucks were often piled high with neatly stacked fennel bulbs with their billowy greens. The feathery green fennel foliage was often used under unwrapped meats and cheeses in the open air markets, while the gleaming white bulbs were munched on, layer by layer, by bored men and served at our scant breakfast buffet. Tunisia is a place where cigarettes are a food group for adult men, perhaps more important than the ubiquitous coffee. We cringed while standing next to the emaciated men buying their smokes1at a time at the food market or emptying their pockets of all their money to stock-up on several packs. 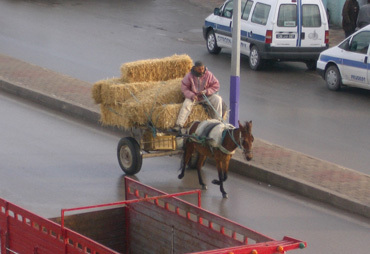 Donkey carts were a common central-city sight outside of Tunis. We find the level of poverty we are seeing hard to measure in unfamiliar cultures, but many of the older men looked dreadful. Their faces were deeply scarred by excessive sun exposure, the hands of many thickened like Sherpa feet from hard work, and an unhealthy leanness that must be a combination of too many packs of cigarettes a day for too many decades when the money should have been spent on food was too common of a sight. Overall the women look healthier than the men, probably in part because the women don't smoke. A few of the country women we saw however, the ones on donkey carts, looked like they were aging too fast, just like the heavy inhaling men. Being out and about with the friendly Tunisian people was relatively easy. Throughout northern Tunisia, men and women mingle with greater ease than in Egypt or Turkey, the only other Muslim countries in which we've lingered, which made it more comfortable for us and more hopeful for their culture. Staring is a national pasttime but leering (at least sustained leering) is not done. Strolling in Tunisia would be more pleasant if we could get the Imams to weave an antilittering campaign into their Friday morning lessons as littering seems to be a birthright in Tunisia as it is on the other side of the Mediterranean. Petty crime didn't seem to be an issue in Tunisia and we were comfortable letting down our guard. We evaluated Tunisia as a tourist destination throughout our stay and it didn't get top marks. It's a good first Muslim country to visit because it is so moderate, and an especially good first North African country as it is not as overwhelming as Egypt. Tunisia would be a good place for some 'trainer wheels' before a visit to Egypt if you don't feel like a hardy traveler. But Tunisia also doesn't deliver the 'wow' factor that Egypt does as its significant historical finds are more meager. The British traveler we spoke with at Dougga however rated Tunisia much higher than Morocco. In his mind, Morocco only has one really good historical site and is overly touristy. 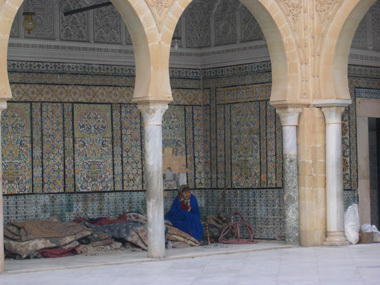 We've also read that the hussles and hassles in Morocco are substantial. We aren't beach resort folks but we weren't impressed with what we saw for beaches in Tunisia. I'd probably head for Turkey or Greece for a package holiday at the sea instead of going to Tunisia. Tunisia also isn't a good place to start one's self-directed ancient history studies as the historical sites and museums lack thorough explanations. Countries that have funneled more money into their historical sites, like Italy, Greece, and Turkey, are better first-stops for 'road scholars.' That being said, Tunisia did deliver what we came for, which was a relatively warm place to be in March where we could see some distinctive ancient historical sites, so we were satisfied with our visit. If you aren't quite ready for your Tunisia experience to end, check out "Country Details/Tunisia" and scroll half way down to "Biking in Tunisia." There you'll find a few more insights, some shaped by our conversation with a French man and Columbian woman who had biked in southern Tunisia where we didn't venture. We've been in Sicily almost 2 months now and are still having a grand time. Sicily is edging its way to the top of our list of favorite biking destinations--especially since Bill discovered the B&B websites. The B&B's are a new phenomena in Sicily and are a moderately priced way for us to consistently have pleasant rooms and never share our sleeping hours with screaming school groups running in hotel halls. Having started in the far west at Tràpani in March, we've worked our way through the inland hills of western Sicily, cruised along the northeastern coast from Cefalu and then turned the corner at Messina to head south. Our most recent excursions have focused on slightly inland Mt Etna. Bill is struggling as to whether to continue biking along the southern coast of Sicily or to save it for next year and instead launch ourselves north onto another Italian island, Sardinia.